While we say “good riddance” to New Years resolutions at Delucchi Plus, we’re still suckers for great industry predictions and a solid power move. 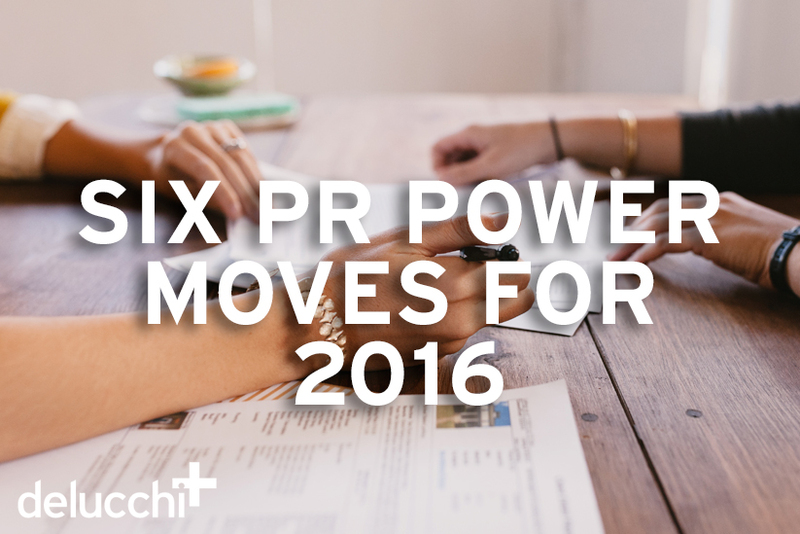 With that, we’re proud to bring you six helpful tips, tricks and moves to make good with the media in 2016. While thought leadership is a growing commodity, industry authority is now a “must-have” in marketing and PR. According to John Hall, CEO and co-founder of Influence & Co., “People are looking for a real connection to a brand or product. The best way to establish a connection and build trust is to create content that showcases your authority.” Take stock of your team’s expertise, insights and unique industry approach, then develop messaging that not only adds true value to industry conversations but puts your brand on the leaderboard. Online reputation management is also a must-have for 2016. It doesn’t matter how solid your pitch is, a few seconds spent searching and reviewing an online reputation can make or break your media relations efforts with editors. To get ahead of the curve and above the fold on Google, it’s important to consistently create, publish and promote quality online content. The Solution: Avoid social media spirals and PR nightmares by acknowledging online naysayers and embracing feedback — the good, the bad and the crazy. Surprise surprise, content will still reign king in 2016. While some argue we’re hitting a saturation point for content marketing, quality visuals, video and quick copy will always win out in PR and the wild west of social. Trade in your traditional press release for a spiffy new infographic complete with social activations and amplifications to push your message along. While social media is blurring the lines a bit, PR is not a one-stop-shop designed to drive sales. Good public relations rely on a slow burn strategy that pays off with stories when brands and practitioners are given the time to cultivate relationships and explore angles. Like any good relationship, slow and steady wins the race.